Here we see Jonas Bico facilitating our Small Group Discussion (SGD) on a pediatric case of bacterial infection in an immunocompromised host. He was a pro. He fondly addressed each of us with the "Doctor" title which made us feel better given our vast ignorance in medicine. 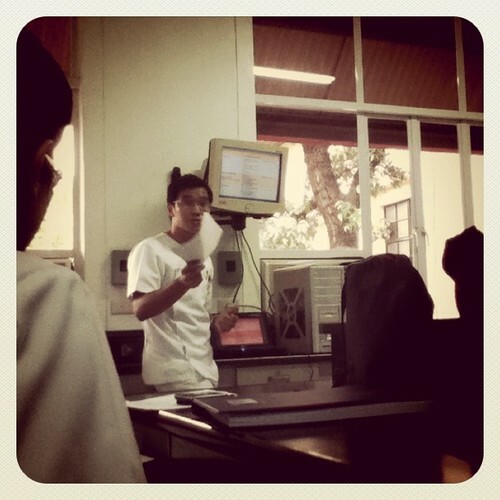 We burst in laughter when he mistakenly addressed a macho male classmate as doktora. Even I'm only halfway though Med, I know that this session will turn out to be one of the most memorable SGDs I'll have. When I answered the consultant's questions, it was as if there was a disconnect between my mouth and my brain. My groupmates will probably relate to you quotable quotes, some of them having come from me. But suffice it to say that after the session, we all ended up laughing, our tummies painfully aching in a nice kind of way. That's a quick update. Exams are coming up tomorrow. Like I always say, once the exams start, they never stop coming.